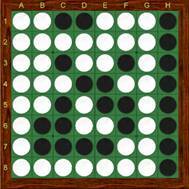 Reversi is a classic board game for two players just like chess, checkers and go. Black and white, the dark and the light, the good and the bad battle each other for victory. 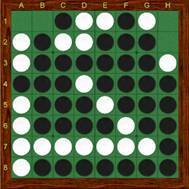 Reversi is a very dynamic board game; the board position can change dramatically with each move. 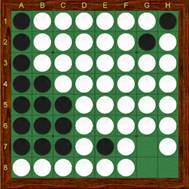 Reversi is also know as Othello. The board is shown below in figure 1. Rows are numbered from 1 to 8 starting with the top row. Columns are named a to h, from left to right. 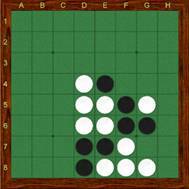 The starting position consists of two black discs at e4 and d5, and two white discs at d4 and e5. Black will play the first move. Figure 1: Board with starting position. You can play a disc when you flank one or more opponents discs between your new disc and any other of your own discs, in the same horizontal, vertical or diagonal line. The opponents discs that are flanked will be turned upside-down and change colour. This turning is called flipping. In figure 2, e5 will be flipped when playing a disc at f5. When discs are flanked in multiple directions, these have to be flipped as well. For example, in figure 3, d5 (diagonally flanked) and e4 to e6 (vertically flanked) need to be flipped, when playing a disc at e7. Figure 3: More than one disc is flipped. When there is no possible legal move, the turn is given back to the opponent. This is called a pass. In figure 4, black played g8. White is not able to play because he cannot flank any of the black discs with a new disc. White passes and black will move again. After that move, white has to move. If white is still not able to move, he will have to pass again. Figure 4: No move is possible for white. 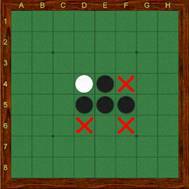 If both players need to pass because there is no possible move for any of them, the board game has ended. Normally, this will occur when there are no more empty squares (figure 5a). 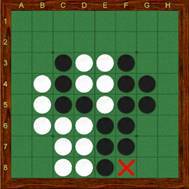 In some occasions, one or more squares remain empty and none of the players have access (figure 5b). The discs are counted. Whoever has the most discs wins the board game. Empty squares are added towards the winners amount. If the result is 32-32, the board game is a draw. 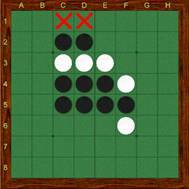 Figure 5a: White wins, 40-24. Figure 5b: Black wins, 41-23. 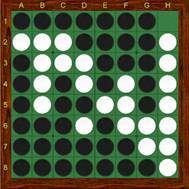 The rules allow you to play Reversi, but you need some strategy in order to increase the chances of winning. To get a better understanding, you may divide the game into opening, midgame and endgame. For his first move, black can choose between four moves: d3, c4, f5 or e6 (figure 6). These moves are basically the same, because the new position will be identical, either mirrored or turned 180 degrees. Thus any board game can start from four different orientations. Figure 6: Black can move into 4 directions. In his first move, white can choose between three moves. He can either choose d6 (perpendicular opening), f4 (parallel) and f6 (diagonal). This is shown in figure 7. Figure 7: White can choose to open with either a parallel, diagonal or perpendicular move. 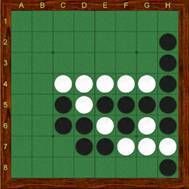 The parallel opening is played less frequently, because it is a known advantage for black. It will be obvious to observe after a couple of games. On the contrary, the opponent may be surprised by playing this opening and lack sufficient knowledge. The diagonal and perpendicular opening are both good openings, in which neither black or white have an advantage. 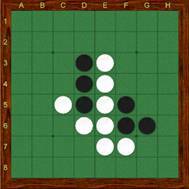 After white decided one of the three main directions, black can further differentiate the opening. Examples of common openings are given in table 1. Each opening has its own characteristics, which you will discover when playing them. Next to the above-mentioned openings, many others exist. Depending on personal preference, your current opponent and need for variability, you can select an opening. If two experienced players are battling, it may occur that both players know up to 20 moves by heart. They frequently know many different openings and variations. It may be beneficial, but it is certainly not necessary, if you would like to be a skilled player. It is of greater importance to puzzle and think of a good move. There are plenty of possible moves in the opening. The best method to learn is to try many different moves and create interesting positions at the board. In addition, try to avoid playing really bad moves. 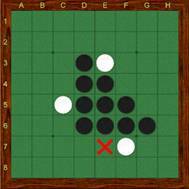 After the opening has been played, the game enters the midgame, although there is no strict threshold between them. 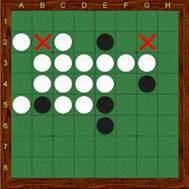 During the midgame, each move is unknown and needs to be thoroughly investigated in order to make a good move. One possible strategy is maximizing discs. Shortly, this means that you try to conquer as many discs as possible. It may work, but is doomed to fail in most cases, because you will run out of moves when approaching the end of the game. If it occurs, you will be blown away (figure 8a). A beginner may claim that white is in an excellent position, but actually he is lost, because all remaining moves will be played by black. Black wins 40-24 (figure 8b). Figure 8a: White has the most discs. Figure 8b: Black wins 40-24. 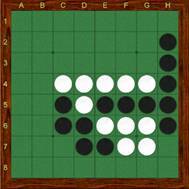 The discs of white were all unstable, because white did not occupy a corner. Black stabilized his discs by conquering the corners. Stable discs cannot be flipped anymore. Corners are always stable and thus discs adjacent to a corner are stable as well. To avoid positions like this, it is useful to understand the concept of mobility. It means that you to try to preserve your options and prevent giving your opponent new options. Figure 9 shows that, if white plays c1, he can not continue with d1 in his next turn, because d2 is flipped with c1. However, if white initially plays d1, c1 will still be available for his next move. By playing c1, white would lose two options with one move. By playing d1, he only wastes one option and thus preserves the other. In conclusion, d1 is a better move. With each move you play, your mobility is decreased and with each move of the opponent your mobility is increased. Figure 9: Will white play c1 or d1? The ultimate example of mobility is shown in figure 10. By playing f8, white does not create new opportunities for black. Therefore, blacks mobility is not increased and whites mobility is only decreased with one move (f8). This is called a perfect quiet move and if the opportunity occurs, it is often the best move available. However, as with each guideline, there are always exceptions, in which other moves may be more urgent. Figure 10: Perfect quiet move. The importance of mobility becomes visible when one of the players is not capable of making any good move. In figure 11, black has only two options, while white still has plenty of options. Black is forced to play b7 or g7. These squares are positioned diagonally to the corners and are called X-squares. 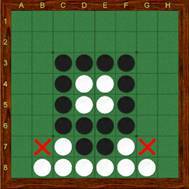 Playing at these squares is dangerous, because the opponent can conquer the corner and accumulate more stable discs in the future. In the meantime, black still does not have many options and it is very likely that he has to sacrifice the other corner as well and will ultimately lose the game. This emphasizes the importance of the midgame. Because your opponent can only move to empty squares adjacent to your discs, a large disc count during the opening and early midgame is not recommended! Figure 11: Black is doomed. 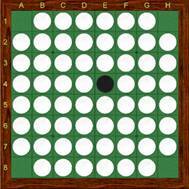 A large amount of discs does not always provide a bad position, especially when your opponent does not have access to important squares. In figure12 it looks like whites mobility is low, while blacks mobility seems larger. 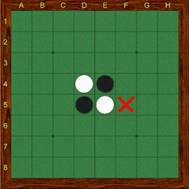 Actually, black can access only two dangerous X-squares and he will be forced to sacrifice a corner. Figure 12: Blacks mobility is low even though there are many white discs. Forced moves occur when they are the only available option left. A forced move is frequently a move that will cost mobility or lose a corner and the loss is nearby. Semi-forced moves are moves that are almost obliged: there are much options, but any other move leads to a clear loss (figure 13). White is semi-forced to play c8. If he does not play it, black will play h8 and secure a corner and adjacent border. Figure 13: Black is attacking corner h8. In games between experienced players a corner is frequently sacrificed on purpose, in order to take advantage of it in a later stage of the game. An example is given in figure 14. White plays g7 and thus sacrifices h8. If black captures the corner, white can make a wedge between the black disc at h8 and the black discs at the right edge. In his next turn, white can capture corner h1 and conquer the edge at the right. This is called wedging. It is possible because black had a five consecutive discs at the edge. This is called an unbalanced edge. In these positions, a corner sacrifice may lead to conquering the other corner, but be aware of traps. Figure 14: White plays g7 and sacrifices h8, but can create a wedge on h7. Block the move which will make it impossible (take away access). Make the move less attractive by requiring your opponent to flip more discs for this move. Make another move more attractive to tempt him to play that one. Play the move yourself, which will make it impossible for him to play there. Whichever of these possibilities is the best, depends largely on your position, your personal style and your experience. 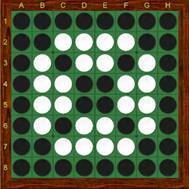 After many games you will realize that many patterns will frequently return in different positions. Recognizing these patterns will help you deciding which move to play. There can be many traps in the game. Try to find these and avoid them if your opponent is preparing them! In conclusion, it is important to look ahead and anticipate on the possible moves of your opponent. If both black and white have succeeded to survive the midgame, the endgame is nearby. Anticipating is still of utmost importance, but optimizing mobility is becoming less important, as you want to end the game with as many discs as possible. Parity is the magic word in the endgame. Parity is the advantage of playing the last move of the game. The discs flipped in the last move can not be flipped back anymore. If your opponent has parity, you will lose at least one disc with his last move. Figure 15 shows two areas of two empty squares. 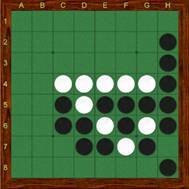 Whichever move black will play, white will play directly next to it and is able to play the last move in both areas. 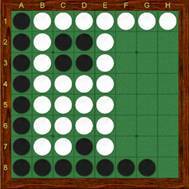 White will increase his disc count in the last few moves because of parity and win the game. If white does not follow parity and play in the other area, black will be able to play the last move in one area and win the game. Figure 15: White will win because of parity. Normally, white has parity, but this can be changed during the game. When a player can not play and needs to pass, the parity changes. Figure 16 shows the importance of parity. In close endgames like this one, parity is very important. Black tends to play h8 and conquer an entire edge of stable discs. After this, white passes and black has to move again. Whichever of the two remaining moves black will play, white will always play the other move and win the game. Just see, what happens if black does not initially play h8. If black plays g8, he sacrifices a corner and an edge. After white taking h8, black plays g7. The game ends in a draw. Figure 16: What will black decide? Of course, parity is not the only key to success. On some occasions, playing against parity leads to a winning sequence. Therefore, counting each disc in the endgame may help you in finding the best sequence. Mobility is not the key concept. Mobility and parity both play an important role in each stage of the game. On some occasions, the best move may be completely against these two principles. Decision making depends on mobility, parity, experience, anticipating, pattern recognition, personal preference and intuition. Author: Roel Hobo (translation: Roel Hobo).